Using high-frequency data, we decompose the time-varying beta for stocks into beta for continuous systematic risk and beta for discontinuous systematic risk. Estimated discontinuous betas for S&P500 constituents between 2003 and 2011 generally exceed the corresponding continuous betas. We demonstrate how continuous and discontinuous betas decrease with portfolio diversification. Using an equiweighted broad market index, we assess the speed of convergence of continuous and discontinuous betas in portfolios of stocks as the number of holdings increase. 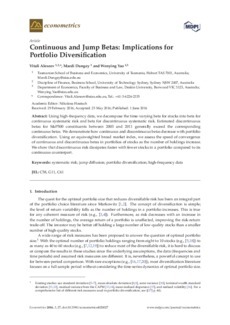 We show that discontinuous risk dissipates faster with fewer stocks in a portfolio compared to its continuous counterpart.